Weight loss surgery – is it under-used in the UK? A recent article in the Guardian asked why people in the UK don’t have as much weight loss surgery as on the continent. I’m not sure this piece explains the full picture. In an article for the Guardian last month, Richard Welbourn (a consultant bariatric surgeon) compared the numbers of weight loss procedures performed on average in different European countries and wonders why, in the UK, we do proportionately significantly fewer procedures. He rightly notes that according to the UN’s Food and Agriculture Organization, 25% of adults (aged 16 years or over) in the UK were classified as obese. Indeed, the UK has the highest proportion of obese people in Western Europe yet on average the other countries undertake 5-10 times as many weight loss (bariatric) procedures. This is despite The National Institute for Clinical Excellence (NICE) recommending weight loss surgery as a first-line option of treatment in the UK for people with a BMI (Body Mass Index) of more than 50. On the basis of these facts, it would seem that Mr Welbourn is presenting a solid argument. After all, if weight can be controlled by surgery, avoiding the adverse health problems associated with obesity – (type II) diabetes, heart attacks, hypertension (high blood pressure), sleep apnoea, fatty liver and arthritis – will save much more for the NHS than the cost of an operation. Additionally, by improving overall health in this way, people will be able to work more effectively, have less time off work through illness, and British industries will save money that would otherwise be lost. Mr Welbourn therefore rightly asks “why is a safe, cost-effective therapy for a deadly disease so under-utilised [in the UK]?” He believes it is due to a social stigma in this country against obesity, and that NHS purse string holders see obesity as a “lifestyle choice”, so it’s OK to blame the patients. But did he stop to think that, at a time when the NHS is chronically underfunded; it might just be that they’re trying to avoid the risks and complications associated with bariatric surgery? 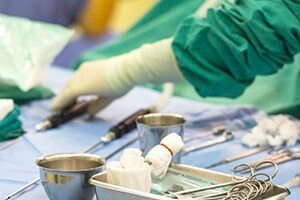 First, weight loss surgery is more complicated than most surgery. Not only is the surgery technically more demanding because of the additional fat but the patients generally are at greater risk of complications due to their underlying obesity. These include increased risk of anaesthetic problems during the surgery and then post operative wound infection, respiratory problems and deep vein thrombosis (DVT”). Furthermore, each type of procedure has its own risks/complications. Patients who have had a gastric bypass have a 4% risk of a leak from one of the join sites and if a leak is not treated promptly can lead to fatal sepsis. 1 in 25 cases is pretty high if we’re talking about increasing the number of procedures. And even if successful, patients generally need lifelong vitamin and nutrient supplementation and nevertheless can still suffer from fatigue, poor skin, hair and nails. Diarrhoea is common and can be debilitating and ulcers (published risk 1-16%) at the join sites are also a recognised complication. Sleeve gastrectomies have a 5% risk of strictures in the part of the stomach that remains and a tendency for reflux/heartburn. Also there is a tendency for weight regain after 2-3 years which is a problem given the procedure cannot be reversed. Intra-gastric balloons leave patients prone to heartburn and regurgitation as well as post-patient pain and nausea and complete obstruction of food passing through the stomach. Any one of these complications can significantly blight a patient’s life and result in long term treatment needs and disability that, rather than reducing the overall NHS spend and impact on the economy, in fact have the opposite effect. Therefore, it may not be a question of obesity stigma stopping procedures from being undertaken, but simply a more cautious balancing of the risks and benefits of weight loss surgery than on the continent.